Abstract: The Neolithic and Bronze Age transitions were profound cultural shifts catalyzed in parts of Europe by migrations, first of early farmers from the Near East and then Bronze Age herders from the Pontic Steppe. However, a decades-long, unresolved controversy is whether population change or cultural adoption occurred at the Atlantic edge, within the British Isles. We address this issue by using the first whole genome data from prehistoric Irish individuals. 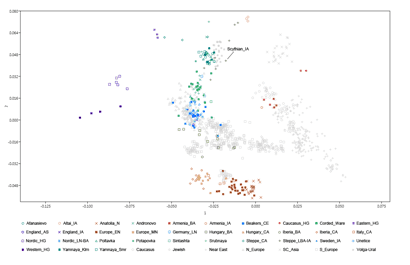 A Neolithic woman (3343–3020 cal BC) from a megalithic burial (10.3× coverage) possessed a genome of predominantly Near Eastern origin. She had some hunter–gatherer ancestry but belonged to a population of large effective size, suggesting a substantial influx of early farmers to the island. Three Bronze Age individuals from Rathlin Island (2026–1534 cal BC), including one high coverage (10.5×) genome, showed substantial Steppe genetic heritage indicating that the European population upheavals of the third millennium manifested all of the way from southern Siberia to the western ocean. This turnover invites the possibility of accompanying introduction of Indo-European, perhaps early Celtic, language. Irish Bronze Age haplotypic similarity is strongest within modern Irish, Scottish, and Welsh populations, and several important genetic variants that today show maximal or very high frequencies in Ireland appear at this horizon. These include those coding for lactase persistence, blue eye color, Y chromosome R1b haplotypes, and the hemochromatosis C282Y allele; to our knowledge, the first detection of a known Mendelian disease variant in prehistory. These findings together suggest the establishment of central attributes of the Irish genome 4,000 y ago. - first to show with ancient genomes that the Anglo-Saxons made a significant genetic impact on England. See here. Eventually confirmed here. - first to show that the southern admixture in the Yamnaya pastoralists of the Early Bronze Age steppe was Georgian-related rather than Armenian-related. See here. Confirmed here. - first to show that Anatolian Neolithic farmers were very similar to European Neolithic farmers, and lacked Ancient North Eurasian (ANE) ancestry. See here. Confirmed here. - first to show using ancient DNA and formal statistics that South Asia experienced massive gene flow originating in Late Neolithic/Bronze Age Europe. See here. Backed up with my help here. The fact that Caucasus hunter-gatherers (CHG) like Kotias are essentially an ideal fit for the southern ancestry in the Yamnaya is a big problem for the Armenian Plateau Indo-European homeland hypothesis. This TreeMix graph shows why. Basically, it looks like the Kotias-related ancestry in the Yamnaya came from the North Caucasus, rather than any place closer to the Near East than Georgia. Unless, of course, the southern Caucasus was populated by unadmixed CHG right until the 4th Millennium BC, when the hypothetical Proto-Indo-Europeans from the Armenian Plateau set off on their journey to Northern Europe around the Caspian Sea. But let's be honest, that's extremely unlikely. Indeed, I expect that next year we'll see the first Neolithic and Copper Age samples from Armenia and/or surrounds, and even though they will be in large part CHG, they'll be nowhere near unadmixed. This will essentially kill the Armenian Plateau hypothesis, and thus leave the Kurgan or steppe hypothesis as the only plausible choice. In any case, 2016 will probably be the year when ancient DNA helps to settle the Indo-European homeland question once and for all. So get ready for more ancient DNA from the steppe, but also, among others, from Mesolithic and Neolithic Iran, Mycenaean Greece and the Maikop Culture of the North Caucasus. I'm also pretty sure that the Varna man with the golden codpiece will make an appearance in a paper about Neolithic and Copper Age Bulgaria. Bring it on! Abstract: The process of Near Eastern neolithization and its westward expansion from the core zone in the Levant and upper Mesopotamia has been broadly discussed in recent decades, and many models have been developed to describe the spread of early farming in terms of its timing, structure, geography and sociocultural impact. Until now, based on recent intensive investigations in northwestern and western Anatolia, the discussion has mainly centred on the importance of Anatolian inland routes for the westward spread of neolithization. This contribution focuses on the potential impact of east Mediterranean and Aegean maritime networks on the spread of the Neolithic lifestyle to the western edge of the Anatolian subcontinent in the earliest phases of sedentism. Employing the longue durée model and the concept of ‘social memory’, we will discuss the arrival of new groups via established maritime routes. The existence of maritime networks prior to the spread of farming is already indicated by the high mobility of Epipalaeolithic/Mesolithic groups exploring the Aegean and east Mediterranean seas, and reaching, for example, the Cyclades and Cyprus. Successful navigation by these early mobile groups across the open sea is attested by the distribution of Melian obsidian. The potential existence of an additional Pre-Pottery Neolithic (PPN) obsidian network that operated between Cappadocia/Cilicia and Cyprus further hints at the importance of maritime coastal trade. Since both the coastal and the high seas networks were apparently already well established in this early period, we may further assume appropriate knowledge of geographic routes, navigational technology and other aspects of successful seafaring. This Mesolithic/PPN maritime know-how package appears to have been used by later groups, in the early 7th millennium calBC, exploring the centre of the Anatolian Aegean coast, and in time establishing some of the first permanent settlements in that region. In the present paper, we link this background of newcomers to the western edge of Anatolia with new excavation results from Çukuriçi Höyük, which we have analysed in terms of subsistence strategies, materiality, technology and symbolism. Additionally, further detailed studies of nutrition and obsidian procurement shed light on the distinct maritime affinity of the early settlers in our case study, something that, in our view, can hardly be attributed to inland farming societies. We propose a maritime colonization in the 7th millennium via routes from the eastern Mediterranean to the eastern Aegean, based on previously developed sea networks. The pronounced maritime affinity of these farming and herding societies allows us to identify traces of earlier PPN concepts still embedded in the social-cultural memories of the newcomers and incorporated in a new local and regional Neolithic identity. First came the Indo-Aryans, probably in a couple of waves. 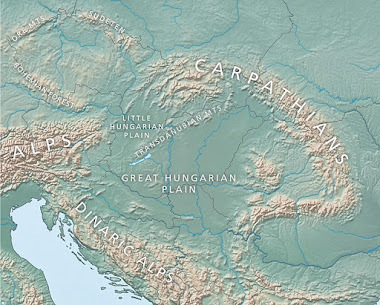 Historical linguistics and archeology tell us that they originated on the Trans-Urals steppe in the Sintashta-Andronovo horizon, and pushed south around 2,000 BC to establish themselves as the ruling elite over Central Asian agriculturalists, who were probably in large part of West Asian origin. There are multiple lines of genetic evidence suggesting that this is indeed what happened, which I discussed in detail in several earlier blog posts, like here. Really cool results. Obviously, Kotias is the recently published Caucasus hunter-gatherer (CHG) genome. The Kalash appear to carry the highest level of Kotias-related ancestry among present-day populations, which they probably acquired from both the Central Asian agriculturists and Indo-Aryan invaders. At the same time, however, Georgians show the highest affinity to Kotias because they harbor less extra-West Eurasian admixture. After the Indo-Aryans came the Iranians, in all likelihood also from the steppe. They were either an offshoot of Sintashta-Andronovo or the more westerly Srubnaya Culture. I'd say the D-stats below, of the form D(Eastern_Iranian,Southeast_Asian)(X,Outgroup), are inconclusive, because the differences are small, and the outcome possibly affected by the methodology and/or sampling bias. But again, the top five results make a lot of sense in the context of historical linguistics and archeology. By the way, Tajik Shugnans are a population isolate in the Pamir Mountains, like the Kalash with low level extra-West Eurasian admixture, and thus likely to be among the best available reference groups for early Eastern Iranians. Interestingly, based on that list the Shugnans look more European than the Kalash. 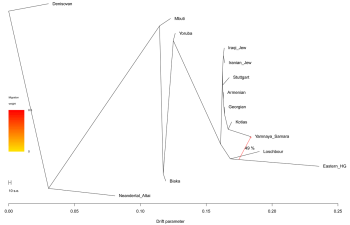 In large part this might be a reflection of the sharp rise in the level of European-specific Western hunter-gatherer (WHG) admixture on the steppe during the Middle Bronze Age, probably caused by population movements originating at the western edge of the steppe and/or in East Central Europe. 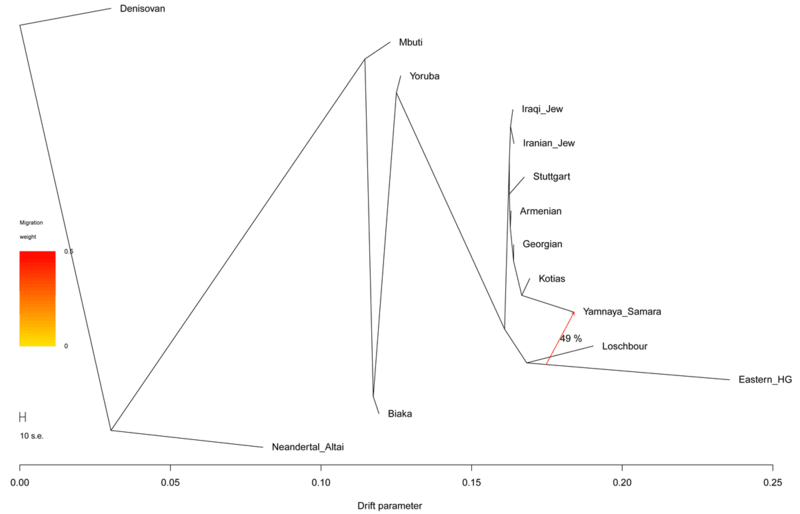 As far as I can tell, the fact that the Shugnans and Kalash have around the same level of extra-West Eurasian admixture means that I can try to hone in on the differences between their steppe-derived ancestry with D-stats of the form D(Kalash,Tajik_Shugnan)(Kotias,X). The top result seems to confirm my hunch, because Loschbour is, of course, a Western hunter-gatherer. More recently, during historic times, large parts of northern South Asia were settled by the Balochi, a Western Iranian people from the South Caspian region, whose ancestors were probably Indo-Europeanized a couple millennia earlier by Proto-Iranians from the steppe moving west across the Iranian Plateau. D-stats comparing the Balochi to the Kalash and Shugnans, respectively, clearly reflect the Near Eastern origins of the Balochi. In this analysis I used ancient samples from the recently published Jones et al. and Mathieson et al. studies, available on request from the authors and at the Reich lab website here, respectively. The present-day samples are from the Human Origins dataset, also available at the Reich lab website. It's time to have a look at the Scythian steppe warrior from the Mathieson et al. dataset. This is the first Scythian individual to be genotyped. He comes from the eastern end of the Pontic-Caspian steppe, is dated to 380-200 calBCE, and belongs to Y-chromosome haplogroup R1a, which is the dominant Y-haplogroup in Scythian and related remains tested to date. His genome-wide data puts him closest to Northeast and Northwest Europeans from among present-day populations, rather than West and South Asians, who should, in theory, carry significant Scythian ancestry. We can probably put this down to the complex ancestry of West and South Asians. Moreover, he can be modeled as a mixture of the Middle Bronze Age Potapovka people of the Pontic-Caspian steppe and present-day Nganasans of Siberia. This gels rather nicely with archaeological evidence, which suggests that Scythians were the descendants of Bronze Age Eastern European migrants to South Siberia, who expanded west across the Eurasian steppe during the Iron Age and eventually ended up back in Europe. Mathieson et al., Genome-wide patterns of selection in 230 ancient Eurasians, Nature, Published online 23 November, 2015doi:10.1038/nature16152. Genotype dataset available here. These data testify the assumption about the existence of mixed Tripolye-Sredniy Stog marriages, because Tripolye population represented the Mediterranean anthropological type according to the not numerous Tripolye burials (Потехина 1999, c.154). It is interesting, that the massive Protoeuropoid type was typical for the oldest and the most eastern monuments of Sredniy Stog, while mesomorphic Mediterranean type was typical for the Igren cemetery, which was one of the youngest monuments related to the second and third periods of the Sredniy Stog culture and synchronous to the Tripolye B I and B I-II. Appearance of pottery with pearls at the settlements of the third period of Sredniy Stog culture and glossy ceramics without ornamentation in the eastern variant sites, as well as the group of vessels with the steppe traces at the Svobodnoe settlement, allow me to assume the existence of mixed marriages between the Sredniy Stog and Northern Caucasus population. Source: Early Eneolithic in the Pontic Steppes, book by Nadezhda Sergeenva Kotova, available at Academia.edu here.